Life-Centered Dentistry partners with you to help you achieve your smile goal. We customize your care to reflect your personal dental health goals and encourage your participation in discussing how to best achieve what’s right for you. Good dental health supports good physical health. Had my first cleaning and filling done today, and have to say it was a pleasant visit again. Tara was a great hygienist, and Dr. Ludwig's dog came in for a visit and sat under me until my filling was finished. This staff is just great. I think I've found my new permanent dentist office. I have been going to Life Centered Dentistry for over 30 years. 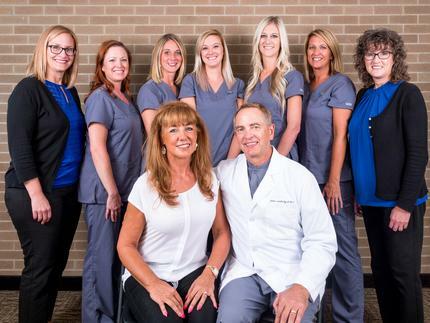 The staff is always so friendly and Dr. Ludwig is the best! I highly recommend Dr. Ludwig and his team! I've been a patient here most of my life and have no desire to look elsewhere even though there are many dentists closer to where I live. I love the family atmosphere and individual care given! Dr. Ludwig and staff are kind, affordable, respectful and thorough. I appreciate the time they take on me and their promptness in starting my appointment on time. (patient of a few years) Bernadette V.
Cares for the whole person. We have been going to Dr. Ludwig for over 31 years. They are professional and care for your whole being. Our children were never scared to go and see the dentist. Comfortable and caring atmosphere. Diana C.
Dr. Ludwig has been my dentist since I was little. He is very knowledgeable and caring. My dental work has held up and looks great. His office staff is friendly and helpful. I would highly recommend him. Dr. Ludwig is the wizard of dentistry. He thinks outside the box. His staff has kept my teeth in pristine condition for a decade. (Patient of a few years) Tommy R.
I've been a patient of Dr. Ludwig since 1991. He has a great team and takes great care of my dental needs. Nicest people in the dental field! (long time patient) Rose R.
FINALLY! Pleasant greetings from the first phone call, through the initial office visit and then it just got better with Dr. Ludwig. His GREAT BEDSIDE MANNER, TECHNIQUE, AND COMMUNICATION ARE SECOND TO NONE!! Dr. Ludwig is incredible! For a few years I have not been able to smile with confidence, and I can now do so because of him! I will recommend him to anyone and everyone. Just got my smile fixed by the best dentist in the area! They always make sure you are comfortable, and explain everything so that you know what is happening. I am always happy when I leave, and look forward to my next visit! Provides during each visit, step by step explanation of the current procedure and upcoming dental needs. Very knowledgeable and takes time to develop a comprehensive treatment plan which assists with financial planning for treatment. The office is a very welcoming environment!